Separately, we have created many pages on the Arithmetics chapter Time Speed and Distance for clear understanding and performance well in competitive exams. Boats and Streams is one of the important sub-topic of Time speed and distance. We have already discussed the core concept and shortcuts formula on this topic in Boat and Streams shortcuts formula part-1. Now we are going to solve some aptitude question of Boats and Streams by using math tricks to save time and score well in our upcoming competitive exam. So, look at below, some essential aptitude question which followed by the question level of the competitive math section. Especially all the questions are selected from the Boats and Speeds chapter. Aptitude question1: A swimmer takes 40 minutes to reach 4 km distance in downstream and 60 minutes to 5 km in upstream. Then, find the rate of the stream and the speed of the swimmer in the still water. 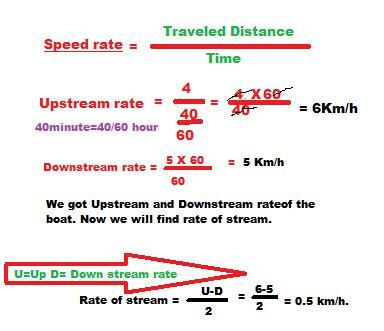 Easy math solution: The shortcut formula for the Rate of the stream is (D-U)/ 2, where U is upstream rate and the D is the rates of downstream. Look at the image for easy math solution. Don't be hopeless to see the Boat and Stream Formula and Solution. You can jump several steps by practice some questions. To get a clear concept, we provide all the steps in the solution. Please note that we used the formula to find stream rate as (D-U)/2. 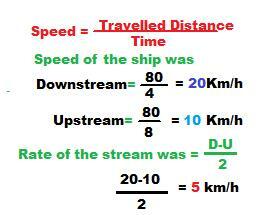 Where D is the downstream speed of the swimmer and U is the upstream rate. ►A ship travelled 80 km in 4 hours in downstream and came back in 8 hours in upstream. Now find the speed of the stream. Solution: The shortcut formula for the rate of the stream is (D-U)/2. Here (D-U)/2 means half of the difference between downstream and upstream rate. To apply this formula we have to find out the upstream and Downstream rate. Look at below how we quickly solve this aptitude problem. Not it easy friends? Look at below for another aptitude question and solution by using math tricks. A man started swimming from Kalighat to another Ghat at the speed of 4 km/h in downstream. He has taken 3 hours to reach while the rate of the stream was 2km/h. If he comeback Kalighat then how long time will he take? Easy solution: The question is looks like a big problem. But it can be solved without any pen or paper. To solve this issue firstly, we have to find the total distance. The man is taking three hours to reach his destination. And the speed of the man in downstream is (4+2) =6. So the man can cover 18km in 3 hours. Now we have to calculate the upstream rate of the person, and it is (4-2)=2km/hour. So the man can come back Kalighat to upstream in (18/2)= 9hour. How you are feeling to knew these Boat and Stream Formula? The comment box is open for you and you can share your thought about this Boat and Stream Formula. As you know that the Time Speed and Distance is also correlated to this Boat and Stream topic and we have also prepared tutorials for you. You may read this these chapter according to your need. We have made this in two sequences. First one prepared with the concept and shortcuts formula and the second one prepared for some solved question on Time Speed and Distance. The links are given below.